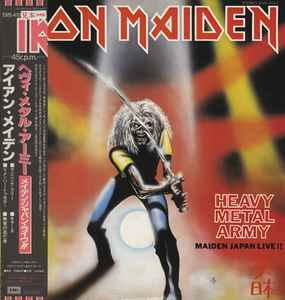 Iron Maiden ‎– Heavy Metal Army - Maiden Japan Live !! This master release contains all versions of the 1981 EP. This was released on 12" vinyl and cassette and features 4 or 5 (North American releases, New Zealand and Brazil) tracks. All versions featuring more tracks are unofficial releases. Venezuelan Releases Iron Maiden - Maiden Japan and Iron Maiden - Maiden Japan have a striking different cover: Eddie holding decapitated head of Paul Di'Anno. Please!! Someone who could order me photos of the front, back part and the singing of this mask to be able to create I one. Thank you very much. ¡¡ por favor !! alguien que me pudiera mandar fotos de la parte delantera ,trasera y el canto de esta carátula para poder crear yo una . muchas gracias. This is so Awesome !!!!!! you will not be sorry !!!!! My copy is identical in every way to this master release, but doesn't have the 'Mini-lp' flag on the front cover.